Interested in Apple’s upcoming Worldwide Developers Conference? Stop me if you’ve heard this one, but there’s an app for th—okay, yes, you’ve heard this one. Apple’s released a universal iOS app for both WWDC attendees and those Apple developers who aren’t making the trip to San Francisco later this month. The app features a complete schedule of proceedings, with descriptions of sessions, labs, and special events; a map of the Moscone West conference center also shows you where each of those talks is being held. You can mark events as favorites, then quickly bring up a list of those favorites, so you can browse them without clutter. If you want to narrow the list of available sessions, you can filter by type (sessions or labs), topic (frameworks, services, core OS, and more), or by platform (iOS or OS X). 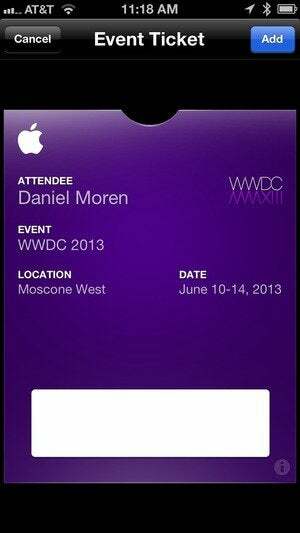 Passbook integration will help speed on-site registration. For those who miss out on a particular session, whether because they didn’t manage to snag an elusive ticket, or simply because they had another commitment at the same time, Apple says that each day it will post videos of the sessions, watchable in the app. You can even start watching on one of your iOS devices and pick up where you leave off on another. The app also offers videos of WWDC from both 2012 and 2011, if you want to play catch up before this year’s conference kicks off. Those on-site will likely want to take advantage of another of the app’s new features: Passbook integration. You can speed up your registration when you arrive by adding your details to Passbook, right from the app. The app also provides the latest news and information for attendees and developers, and allows for feedback on session content and speakers. A free download, the WWDC app requires iOS 6.1 or later and an Apple registered developer account.